ON POINT: Assamba speaking at the recent UK launch of Global Reggae. 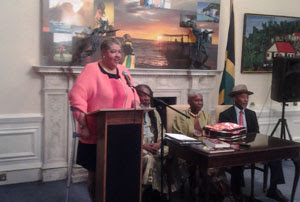 This coming from Jamaica's Ambassador to the United Kingston, Aloun Assamba, who was speaking at the recent London launch of the book Global Reggae, edited by UWI Mona's Dr. Carolyn Cooper. Global Reggae, published by UWI Press, features contributions by Erna Brodber, Peter Ashbourne, Roger Steffens, Clive Walker and Cooper.